Since leaving Mott at the end of 1974, Ian has recorded fourteen (and counting!) mostly brilliant studio albums and several live albums. There have also been a number of compilation albums. All albums listed here have at some point been released on CD, although some may now be deleted. 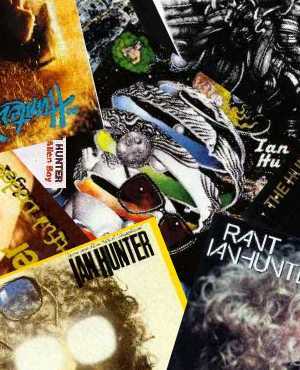 This section lists the original albums released by Ian Hunter, where new and/or previously unreleased material predominates. This section lists best-of compilations and retrospective releases, albums where previously-released material predominates. Original Album Classics Box set of the three albums Ian Hunter, All American Alien Boy and Overnight Angels. Stranded In Reality Sumptuous box set of the albums Ian Hunter, All American Alien Boy, Overnight Angels, You're Never Alone With A Schizophrenic, Welcome To The Club, Short Back 'n' Sides, All Of The Good Ones Are Taken, YUI Orta, Dirty Laundry, BBC Live In Concert, The Artful Dodger, Rant, Strings Attached, Shrunken Heads, Man Overboard, When I'm President and Live In The UK 2010. In addition, there are the rare and previously-unreleased Tilting The Mirror, If You Wait Long Enough For Anything You Can Get It On Sale, Bag Of Tricks, Acoustic Shadows, Experiments and It Never Happened. This section lists archive and other historic releases, albums where previously-unreleased material predominates. Ian has collaborated on a number of albums by other artists. Usually this has been in his role as producer, where he maybe has supplied keyboards or backing vocals on one or more tracks. The list is quite large, and the completist is referred to Sven Gusevik's Outsider fanzine, where he has listed all such albums. I will, however, list those collaborations where Ian's contribution is significant, supplying vocals on at least one track. From Hope by Martin's Folly . 2003 Johnsons Wax Records. Ian guests on one track, an excellent cover of I Wish I Was Your Mother. Mick Ronson Memorial Concert . 1997 Citadel (UK)/2001 NMC (UK). Official release of the first Mick Ronson Memorial Concert, recorded on 29-April-1994 at London's Hammersmith Apollo theatre. Rick Derringer and Friends . 1998 King Biscuit (US). Ian guests on this live KBFH archive concert from 1983. Ringo And His New All-Starr Band . 2002 King Biscuit (US). Ian was part of Ringo Starr's All-Starr Band in 2001, recorded live in concert. The Secret Sessions . 1999 Pet Rock Records (US). Corky Laing, Ian Hunter, Mick Ronson and Felix Pappalardi. Collaborative venture from 1978, finally granted a commercial release. Images of LP sleeves are for illustrative purposes only. Copyright remains vested in the individual record companies. * in the track listings denotes a bonus track on the remastered/reissued CD (ie a track not on the original LP/CD).